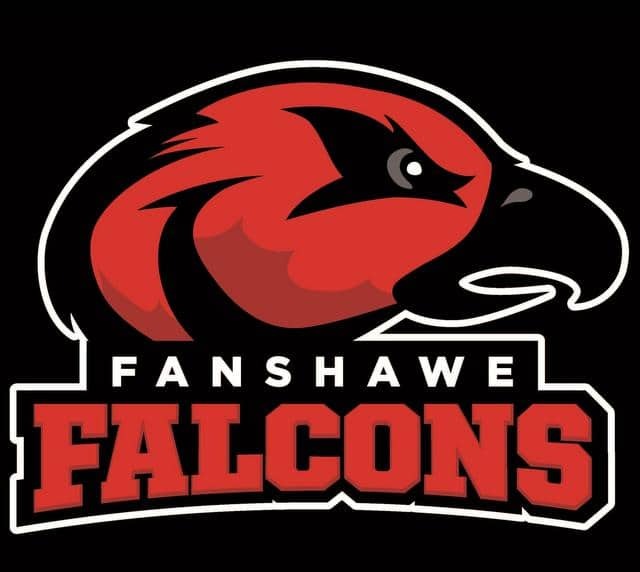 No longer second banana in a city coloured Mustangs purple, the Fanshawe Falcons athletic department has enjoyed a record winning season on provincial and national stages during the 2018-19 school year. The Falcons golf squads have not only played a big part in that success, but also they’re soaring to unprecedented heights. And they’ve accomplished incredible feats while facing adversity on and off the golf course. 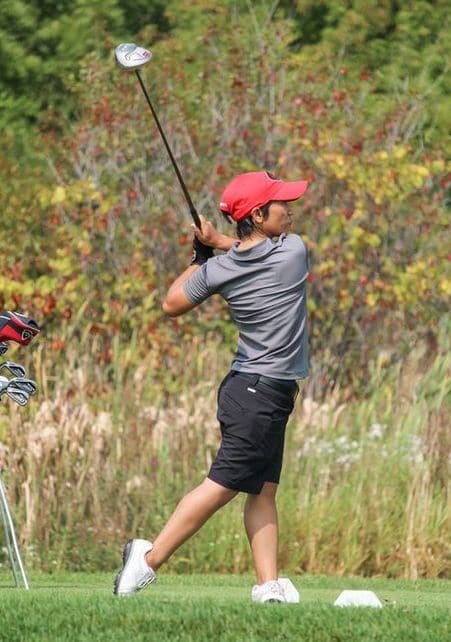 On the heels of hosting the 2018 Ontario Colleges Athletic Association (OCAA) golf championship last October at FireRock Golf Club in Komoka, the Falcons will host this year’s Canadian University/College golf championship at FireRock from May 27-31. Falcons coach Colin Robertson with All-Canadians Braydon White and Alyssa Stoddart. Photo: CCAA. The Falcons will do so with a program so strong, it’s drawing interest from student athletes across Canada and Europe. No doubt, the college’s global presence is teeing up international interest. But you can’t sell short the Colin Robertson-coached Falcons men’s and women’s squads when explaining the program’s new-found star status. In mid-October 2018, Robertson, 33, was named Canadian Collegiate Athletic Association (CCAA) golf coach of the year, prior to his Falcons men’s squad finishing fifth and women’s team sixth at the CCAA golf championships at Desert Blume Golf Club in Medicine Hat, Alta. Weeks earlier, it was all Fanshawe at FireRock, where Braydon White of Barrie and Alyssa Stoddart of Orangeville won OCAA gold in men’s and women’s competition, while Fanshawe women won team gold – a school first – and the men silver. White, a graduate of Fanshawe’s highly-respected Golf and Club Management program, fired consistent rounds of 70-71-72 (E) to finish with a six-shot victory and earn Fanshawe’s first individual gold in 43 years at the OCAA championships. Alex Bober accomplished the feat in 1975. Both White and Stoddart led wire-to-wire at FireRock. Stoddart’s first-place score of 82-80-84 (+27) gave her a six-stroke victory and Fanshawe’s first-ever women’s individual gold medal at the OCAAs. Stoddart and White were both named CCAA All-Canadians, while Robertson was named OCAA Coach of the Year. “(Fanshawe’s manager of athletics) Nathan (McFadden) has done a fantastic job doing what he wanted to do, and that is really putting Fanshawe athletics on the map,” Robertson said. “Golf was something that, for a lot of years, was not showcased as well as it could have been. “But we hosted the OCAA championship, and now the best university and college varsity golfers will be right in our backyard competing, and we’re excited to be the host college for this national event. Our success and our hosting shows just how far we’ve come,” Robertson added. At the college level, golf is a team sport. But you can’t ignore the presence of Stoddart who almost singlehandedly has given new life to the women’s golf program at Fanshawe. Her bronze medal at the CCAAs was Fanshawe’s first national golf medal. Putting a 20-year-old college athlete on a pedestal can ruin that athlete’s career, even before it’s given a chance to blossom. Not every young athlete can handle the pressure put upon them by an entire post-secondary school institution. But it appears Stoddart is the exception – so much so that Robertson said he’s now building a stronger women’s golf program entirely around her. Alyssa Stoddart. Photo: Jeffrey Reed/LondonOntarioGolf.com. In fact, Stoddart said she “welcomes the opportunity to be an ambassador” for the college. The CCAA has a mandate to grow women’s golf. At the OCAAs, only eight women competed, including Stoddart’s only teammate, Mery Tarigan. This season, Stoddart, a first-year Golf and Club Management program student, earned individual first-place finishes at the Fanshawe, Lakehead and Georgian invitationals before capturing OCAA gold and national bronze. She was also the top OCAA golf at the Niagara invitational which included Brock University. Robertson is thankful to have Stoddart as the star attraction of Fanshawe’s women’s golf program. She started golfing at age 5 at Shelburne Golf and Country Club and was coached by PGA of Canada hall of fame instructor Sam Young. After 10 years of junior golf, numerous GAO and Golf Canada tournaments including a third-place finish at the Ontario bantam championship and a stint with the now-defunct Ontario junior development program at Whistle Bear Golf Club in Cambridge, Stoddart gave up the game. Stoddart’s prowess of the tee and deft short game, as well as her leadership skills, have helped her give new life to the Falcons’ women’s squad. It’s that three-part persona which earned her a partial scholarship with McNeese State University in Lake Charles, Louisiana. She was redshirted during her freshman year, and not long afterwards left the U.S. when she decided the American lifestyle wasn’t for her. Stoddart will be a part of the Falcons program next season, and perhaps for a third, before she sets out to launch her own golf academy. She wants to coach golfers of all levels, in particular girls who need a role model. And already her success can be held high for others to see, according to Robertson. “I’m continually getting emails from around the country and even from around the world. Fanshawe has a global presence now with (academic) programs it’s offering. Our athletics are being recognized as well. I’ve had recruitment from at least a half dozen girls across Canada, plus a girl from Holland and a girl from Spain. We’re always keeping an ear to the ground and keeping our eyes open,” he said. Mery Terigan. Photo: Fanshawe Athletics. Tarigan, 26, has an amazing story to tell, too. At age 19, the four-foot-five golfer from Indonesia turned down an academic scholarship in order to work after school every day with four siblings on a vegetable farm, in order to help pay for her brother to attend school. She later caddied in Malaysia, sent her $6 daily pay back home to her family, and fell in love with golf. While caddying, Tarigan met Londoners Paul and Janet Tufts who were working in Malaysia. With their help, she moved to London, studied in Fanshawe’s English Language Studies program and now is a varsity golfer studying in the same program as her teammate Stoddart. Tarigan’s next goal is to raise $35,000 to help build a school in her village of Kabanjahe. In 2010, a deadly volcano erupted outside of the village, changing lives forever. She has created a GoFundMe page at gofundme.com/merycristyna. On March 2, Robertson, his wife, Erica, and son Camden, 2, welcomed a new edition to the family: daughter Emmie Paulina. 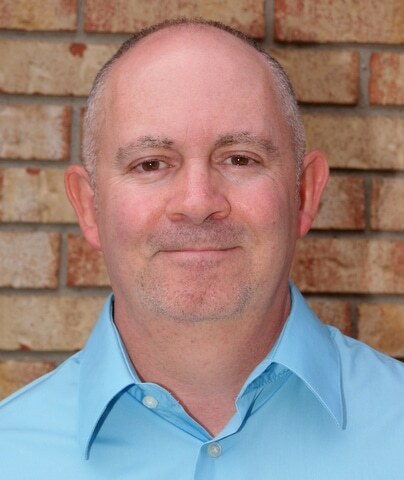 Robertson, who teaches in the Golf and Club Management program at Fanshawe, has created the Robertson Golf Academy with the goal of helping his student athletes improve their game and reach their personal goals. Fanshawe has recently added a golf simulator at its downtown London campus, and will soon add another on main campus. It’s clear that Fanshawe College – and its golf team – are serious about the game. Jeffrey Reed has been a member of the London sports media since 1980. His column, Reed On The Greens, is the only two-time winner of the Golf Journalists Association of Canada’s writing award for Best Website Feature Column. Reach Jeffrey at jeff@londonontariogolf.com.